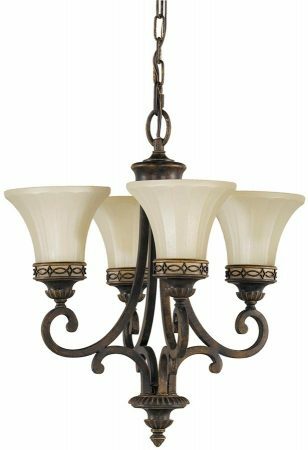 This Feiss Drawing Room 4 light chandelier in walnut with amber scavo glass shades is traditional and features Edwardian period style. Hanging from an intricate ceiling mount and chain link suspension, with a heavy scrolled ironwork frame and detailed golden finial. The upward facing amber scavo glass shades sit within diamond fish-tail cast aluminium holders and give a warm, soft light. 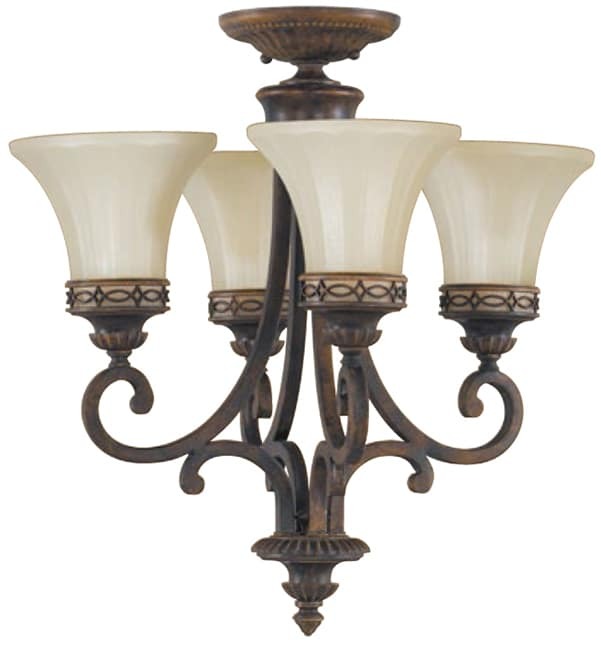 A wonderful, larger sized four-light chandelier, with detail and scrolled frame enriched by the classy Edwardian style. The amber scavo glass shades diffuse the light and fill the room with a beautiful warm glow. The warm gold highlighted walnut finish emphasises the quality of this light and enriches any traditional, period or classic home. It’s nice to see a four light chandelier as there are not that many in production. This dominant style is so aptly named as you can quite imagine it being the central feature light in a cosy traditional drawing room. This dual mount fitting is supplied with 152cm of chain suspension that can be shortened at the time of fitting to achieve the perfect ceiling height or fitted directly to the ceiling as a semi-flush light; please see the secondary image and technical information below for details. This stunning light is supplied by Elstead Lighting and designed in the USA by Feiss, founded in New York in 1955. They have become well known over the years for their contemporary yet classic styling, quality and great original designs like the Drawing Room 4 light chandelier in walnut with amber scavo glass shades you see here.